On our spring Discover Wildlife Weekend in May I took the group to Glengarrif in Co. Cork to see if we could catch a glimpse of the white-tailed eagle pair that were breeding in the area. We got a bit more than we bargained for — first seeing an adult fly in to the nest with food from a vantage point on the mainland, with food, and later witnessing an action replay as the mother flew in while we were on one of the commercial ferries operating out of the Blue Pool. The ferries operate in the bay constantly, and the birds are well used to their comings and goings. They were completely oblivious to us as we watched the mother feeding her youngster. We were all awestruck by the wildlife spectacle unfolding before us… an eagle encounter second to none, right here on the south coast of Ireland. At the time of these photos the chick, since dubbed “Eddie the eagle”, was just over four weeks old. At ten weeks officials from the Golden Eagle Trust and National Parks and Wildlife service tagged him so they could keep track of his movements (see photo left), and last week, a little later than expected at some 14 weeks old, he finally fledged to become the first Cork born eagle to take to the skies in around 125 years. Please do bear in mind that you can’t simply wander up and start photographing eagle nests. You need a license from the National Parks and Wildlife Service to photograph any bird at the nest in Ireland — from a robin to a white-tailed eagle. The gallery below features a selection of images taken from the Blue Pool ferry under licence from the National Parks and Wildlife Service. It was a stipulation of the license that these images could not be published until after the chick had fledged. Now that he has I can finally share them with you. It’s fantastic to have another eagle in the skies of County Cork. Eddie is likely to travel widely over the coming years before establishing his own territory and hopefully finding a female to raise some youngsters of his own. 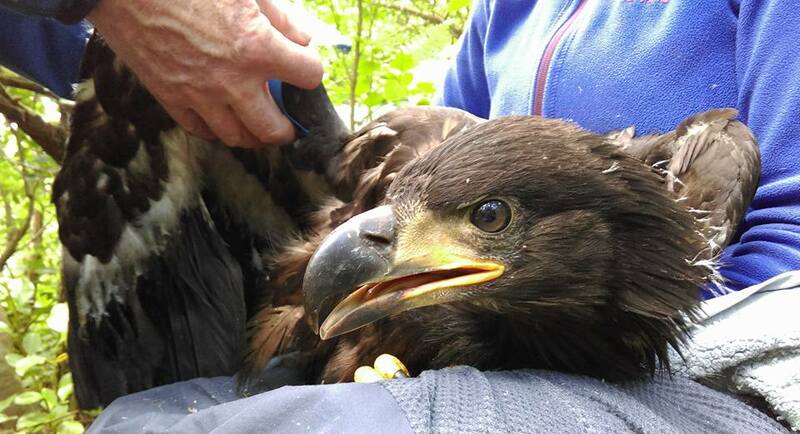 White-tailed eagles don’t reach maturity until around 5 years of age, but with a bit of luck perhaps Eddie will return to his home county when it’s time to settle down. Huge congratulations to the Golden Eagle Trust on another significant milestone for the white-tailed eagle reintroduction project… and especially to Clare Heardman, the National Parks and Wildlife conservation ranger based in Glengarriff, who’s been keeping a close eye on the Glengarriff eagles since they set up shop in the area a number of years ago. Fantastic news. Congratulations to all involved.